In recent years, China has been touting its efforts to fight climate change, including its vow to reduce greenhouse-gas emissions by cutting down coal production. Yet a new study reveals that the country has failed to control its emissions of methane, a common side-product of coal mining, which can be as much as 84 times worse than carbon dioxide when it comes to warming the planet than carbon dioxide. In 2010, China set a goal to control methane emissions by using the gas extracted during coal mining for heating or electricity generation: it wanted to use 5.6 million metric tons of coal-mine methane by 2015. That’s the equivalent of eliminating the entire methane emissions of Australia or Canada, according to a study by scientists at Johns Hopkins University. But methane emissions continued to rise by around 1.1 million metric tons every year between 2010 to 2015, according to the study, which was published in Nature Communications today (Jan. 29). Researchers conducted the research using GOSAT, a Japanese greenhouse-gas observing satellite launched a decade ago. Data from the satellite between 2009 and 2015 show that methane emissions increased faster in China, India, Central Africa, and South Asia than the global average. China’s failure to control methane emissions could be the result of several obstacles, noted the study, which cited analysis from the US Environmental Protection Agency and the International Energy Agency, an intergovernmental organization. Many Chinese coal mines are located in rural areas which lack the infrastructure (pdf, p.25)—such as pipes, compressors, or power plants—needed to bring methane gas to the market for use. In addition, coal mines in China are often deeper underground compared to those in the US and Australia, for example. And even after operators get the methane out, they typically don’t have the technical expertise (pdf, p.4) to use the methane for electricity production or heating. And local companies often aren’t willing to take the coal-bed methane, because they don’t have policies in place to pass on the cost of additional infrastructure onto consumers. Additionally, local authorities only have limited power to enforce national regulations. 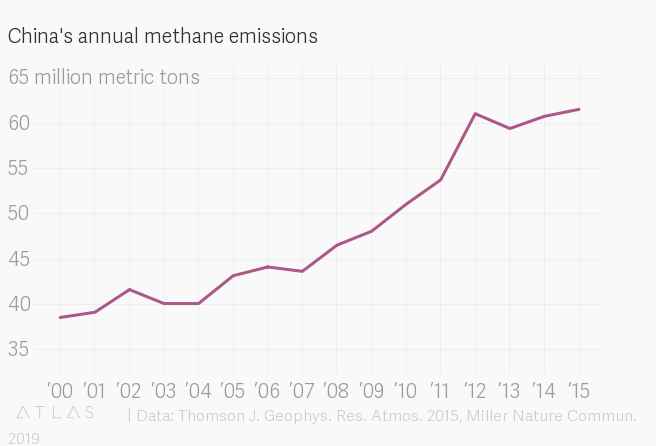 It’s essential for China to make use of the methane. It would not only help the country cut its greenhouse-gas emissions, but would help wean it off natural-gas imports. In November, China overtook Japan to become the world’s biggest natural gas importer.